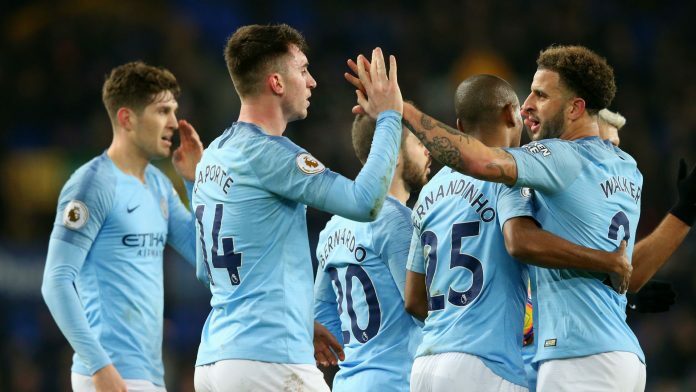 LIVERPOOL: Manchester City seized first place in the Premier League on Wednesday with a 2-0 win over Everton that moved the champions above Liverpool on goal difference. Pep Guardiola’s side took the lead through Aymeric Laporte’s header on the stroke of half-time at Goodison Park. Gabriel Jesus struck in the closing seconds to seal a victory that moved City level on points with Liverpool and allowed them to return to the top of the table. Second-placed Liverpool have a game in hand on City, who were playing Everton in a game brought forward due to a fixture clash with the League Cup final against Chelsea later this month. It was a far from an inspired performance from City, but it was enough to turn the pressure back on Jurgen Klopp’s faltering team, who had occupied top spot since December 8. Liverpool’s successive draws against Leicester and West Ham have allowed City back into the title race just when it looked like the Reds were set to take control as they chase a first English crown since 1990. The opening goal came from a free-kick, needlessly conceded by Idrissa Gueye and taken by David Silva. The Spanish midfielder curled in a perfect delivery which found Laporte unmarked, and only eight yards from goal, for a perfect header. It was the 16th consecutive league and cup game in which Guardiola’s side had scored a first-half goal, a run dating back to their first league defeat of the season at Chelsea in early December. And in the context of the title race, it may yet prove to be one of the more important, although it took until deep into stoppage-time of the second half for City to claim their second. Kevin De Bruyne played in Jesus, whose initial run was blocked by Jordan Pickford only for the ball to sit up kindly for the Brazilian to head into an open goal. That was a cruel finale for Marco Silva’s out-of-form team, who had battled admirably in the first half and not given up a single shot on target to that point. In fact, Brazilian Bernard came close to opening the scoring when he met a cross from opposite winger Theo Walcott and delivered a shot which Ederson was required to turn around his post. City had looked certain to take the lead after 19 minutes when Ilkay Gundogan slid in to meet David Silva’s excellent cross, but succeeded only in scooping his shot against the Everton bar. Laporte had also missed a free header at the far post in a spell of early City pressure but, by the time he redeemed himself at the end of the half, Everton appeared to have weathered the worst of it. Indeed, by the half-hour mark, Guardiola cut an increasingly frustrated figure on the touchline, arms waving at every over-hit pass and misplaced and overhit through ball. But the first goal, and its timing eased the pressure on City and turned it, in no uncertain terms, on Everton’s cross-town rivals Liverpool. After the restart, City sought the goal that would kill off Everton’s threat. Yet, as had been the case in the first half, all too often promising play broke down in the final third. Pickford failed to deal with a deflected Gundogan cross, with Sergio Aguero shooting wide with an overhead attempt before Guardiola brought on substitute Raheem Sterling in an effort to introduce a more clinical edge. It almost worked, as England forward saw a shot deflected onto the roof of the net following a spell of uncertain defending from Everton and a couple of failed clearances. There was a late scare for City when a mistake by Kyle Walker gifted the ball to Richardson who should have played in Cenk Tosun only to see his pass easily cut out by Ederson.